India: Ganganagar and Chandrapur 48.2c, Amraoti 48.0c, Nagpur AP 47.9c (Highest ever for Nagpur)*, Amritsar and Churu 47.2c, Raipur 46.6c, Delhi Palam 46.3c, Delhi Sjung 44.9c. *Nagpur City old Observatory , which is not functioning now, has a recorded temperature of 48.6c on 24th May 1954. Mumbai recorded 944 mm of rain mainly on July 26 2005. However, the weather record books will show July 27 2005 as having recorded that rain. More glaringly, Nagpur recorded its highest ever temp of 47.9 C on May 22. But, again the weather records will show May 23 as having recorded that temperature. This is due to the day's weather report being published at 8:30am - These have recordings from previous 24 hours. Is this a standard worldwide practice? Or is this arrangement specific to India/IMD? yesterday night bangalore lashed by heavy rainfall accompanied with thunderstorm . it may be the heaviest rain of this year. 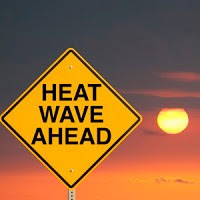 When will we get respite from the heat wave in Nagpur. Why is Vidarbha so hot compared to other areas of India. One interesting place that i can see in the list is Churu. In the depth of winter, Churu would regularly feature as a place where the lowest temp in the plains is recorded; now it has gone up to 47 C.
As for our part here, not much heat for the past five days or so - but rain almost everyday - with May 20 recording 53 mms of rain - and most of it fell in around two hours of extremely heavy rain. Other days have been cloudy with some rain as well. Avtansh: The day temps are recorded as of 24 hrs 5.30 pm IST..hence for records they go in the same day. Internaional recordings are done at 12 mid night. I expect the rains to increase in W.Nepal on Tues/Wed (last) mentioned in blog. Look out for rainfall total in Kathmandu - and Nepal for today - 23 May. Could be some kind of record looking at the way it has been raining for past two hours here. Cloud over Arabian sea moves away from south west, hence south again started boiling, with AP leading, followed by TN, KAR. Total pre-monsoon rain over BANG is only 100mm, let us see if it reaches 800mm yearly rain, last year it was only 400mm (yearly rain). Thanks for sharing correct rainfall stats for bangalore. This year pre-monsoon rains in bangalore has been excellent. till today both the south and north bangalore has received the rain up to 240mm as pre monsoon rain. not sure about the imd bangalore location. most of the time it gives weird reading. Bangalore pre monsoon average is 200mm.